A couple of weeks ago I shared with you a Witches Skull project that was from the $1 store. Since then I have been back to a few of our local $0.99 and $1 stores to find unusual items that I saw potential in. This week I am going to share with you an idea I fell in love with on Pinterest. The original was done with real pumpkins and if any of you have bought real pumpkins lately you would find they are about the same price as what I paid for these artificial ones at the $1 sore. However, I don't want to remake these every year. So I opted for the fake pumpkins. Print "Trick or Treat" (or any other saying) in the desired font on your computer. Step 1: Spray paint - the pumpkins with primer or several coats of the off white and the silk leaves with the black. Step 2: line up the printed "Trick or Treat" on the desired pumpkin and trace over the printed word slowly with the Sharpie. Remove the printed word when done. Step 3: Fill in the outlined letters with black acrylic paint and paint the stem with also. 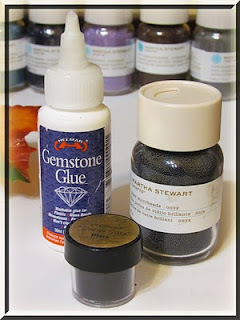 OR, use gemstone glue to fill in the letters and then glitter or micro bead them. Supper cute! Here you go! Don't you just love it. Now I had all the supplies accept the pumpkins in my craft room. Get crafty and use what you have. SO totally cute, Grace! What a great idea!